Becon Medical Limited has introduced a complete portfolio of advanced, disposable LipoFill™ instruments developed for these exacting procedures, which enable the surgeon to gently harvest and transplant intact cells with a minimum of trauma and a high probability of tissue survival. After repeated autoclaving, reusable cannulae will corrode and pit, both internally and externally. Blood and tissue residues harden and accumulate over time, clogging the interior lumen. The combined effect of pitting and internal debris negates the intent of infiltration cannulae, which are designed to preserve the viability of fragile cells. Adopting single use LipoFill™ cannulae assures the smooth transfer of aspirant and enhances the probability of a successful graft. Recent concern about cross-contamination has focused international attention on the obstacles to successfully sterilizing surgical cannulae. Cannulae, with their closed tips and thin bore, present obvious impediments to thorough cleaning. Since an instrument must be completely clean to sterilize, the inevitable presence of residual tissue, blood, fluids and other contaminants in the lumen of a cannula casts doubt on the efficacy of their sterilization. 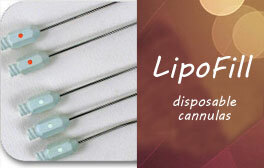 LipoFill™ disposable cannulae allay all concerns of contamination from prior use, and will distinguish your practice as a unique provider of safe and effective microinfiltration instruments. 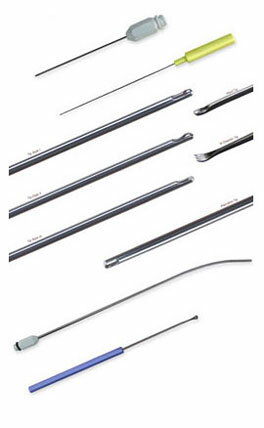 Sterile, disposable instrumentation eliminates danger of cross-contamination. Ultra thin wall for maximum internal flow. NEW Hood tip style included in this series. NEW facial and body dissectors.